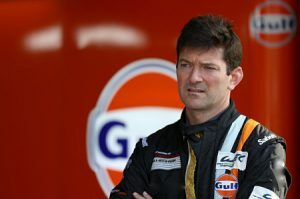 This month we caught up with Mike Wainwright – Businessman, Race Team Owner, World Endurance Championship Driver and Gulf Enthusiast, to find out a little more about what drives him to drive… and how Gulf Racing fits into the rest of his busy life. Q – When did you start to become interested in motorsport and what inspired the formation of Gulf Racing ? MW – I guess I have been interested in cars since my childhood, but I became more interested in my early 20s when I started to actively race go karts for fun. This lead to track days with cars and eventually to my first official race – at the Dubai 24hrs. Gulf Racing was set up by Roald Goethe (ROFGO) and myself because, having raced as individual drivers in other teams, we felt we could do something more unique amongst ourselves. Rather than following someone else it would be our ideas and obviously the already existing relationship with Gulf Oil International allowed us to bring this together (although Roald is now completely with ROFGO and has no involvement with Gulf Racing). Q – What does being part of Gulf’s Motorsport history mean to you and what is your favourite Gulf car of all time? Q – Gulf Racing is now in its second full year in the WEC, how has the step up from the European Le Mans Series been? MW – Great – the longer races help as it gives me more driving time and with that time brings experience – obviously the international races outside Europe bring prestige to the series overall. Q – As team owner how involved are you in the day-to-day running of Gulf Racing? MW – To be honest I have little day-to-day involvement as Matt and the guys know what they are doing and there is no need for me to interfere. Q – Unlike some of the other Gentlemen Drivers in GTE Am, who are full-time racers in all but name, you have a very active business career and a family. How do you manage to balance the demands of work, family life and world championship motorsport? MW – This is the hard part and, to be honest, puts me at a disadvantage compared to some of the other drivers-teams as I really don’t have enough time to do sufficient testing. However, moaning about it will not change much, so I just need to get on with it. Thankfully my family enjoy coming to some of the races and this helps balance the time away from home. Q – What have been the high and low points in your Gulf Racing experiences so far? MW – I guess the high was coming 5th in class at Le Mans in 2016, though winning at Silverstone in 2015 was a nice achievement and obviously our most recent podium and first in the WEC at Mexico can’t be forgotten. Racing has its ups and downs and whilst it can be frustrating at times, I don’t remember the bad times as, in the end, I am there to enjoy it…….and that I do! Q – What are your goals for Gulf Racing and for yourself in Motorsport? Q – When you your not at work or at a race, what do you do to relax?